The iOS SAP Mobile SDK version 3 SP05 has some truly awesome new features, ranging from a major upgrade to the networking layer, to a new “harmonized” API for working with OData services online and offline, to a Usage collection API, to a new cloud-hosted ‘Discovery Service’, that allows mobile apps distributed through public app stores to discover their connection settings with an end-user’s email address. In this post, I’ll cover the HttpConversationManager, the new networking library for the SDK, which adds support for SAML2, OAuth2, and provides a flexible framework for enterprise authentication in your apps. Successful mobile app development in the enterprise, particularly on-premise, really hinges on highly-usable solutions for networking and authentication. To this end, I’m very proud to share the HttpConversationManager, the new networking API for the mobile SDK in Release 3 SP05. Earlier generations of the mobile SDK networking on iOS depended on networking layers implemented on the CFNetworking API set, commonly known as SDMRequesting, SDMConnectivity, or simply <Requesting>. The core libraries implemented support for basic, mutual-auth, and session-token (including CA Siteminder(c)) authentication types, and were instrumented for traceability with SAP Passport. The limitations of the API demonstrated themselves in two main areas: ease-of-use, and extensibility. When the API’s were first developed, in 2010 and 2011, the concept of standardizing on Apple’s native API’s for lowering the developer learning curve really hadn’t taken hold in the industry; the methodology of joining NSURLConnection and NSOperation (a la AFNetworking) wasn’t fully fleshed-out, So, -requestDidFinish: and -requestDidFail were relatively straightforward implementation choices. But, as iOS 5, 6, 7, 8 evolved, Apple built up the stack on the NSURL API set, including powerful tools like NSURLProtocol, NSURLSessionDataTask, completion blocks, Kerberos support, etc. It was only natural that we should upgrade our communication stack to take advantage of this wide variety of features. Note that the NSURLSession method returns a NSURLSessionDataTask; the HttpConversationManager -executeRequest: method creates a NSURLSessionDataTask internally, by invoking the above method. Both have similar completion handler interfaces, with the HttpConversationManager also returning the raw NSData of the reponse. If we are so committed to reusing standard iOS API’s, why implement the HttpConversationManager at all? In fact, our initial prototype was implemented as a category on NSURLSession directly (NSURLSession+HttpConversationManager.h). The answer goes to the point of why we chose this moment to do the update: support for SAML2 (and OAuth2) authentication, for working with SAP HANA Cloud Platform, and the upcoming SAP HANA Mobile release. The NSURL delegate APIs are robust and well-known for handling authentication challenges over HTTP/s, and the NSURLProtocol is an elegant, if lesser known (and minimally documented) method for globally over-riding the URL loader behavior. But, SAML2 support for native applications presented a challenge: SAML2 is really designed around interactions taking place in a browser or webview–not in a native client. Specifically, the HTTP Web Post Profile, which is standard on SAP ID Service, relies on the browser to load HTML content with an embedded onLoad() function to redirect to the SAML identity provider (“IdP”). Unfortunately, this HTML content doesn’t come back as a 401 authentication challenge: it returns with a 200! And, once the redirect to the SAML IdP occurs, the authentication challenge often comes as a HTML form. So, there is a major benefit in using a browser or webview to handle this interaction, and some filter needs to be available to discover responses which happen to be SAML authentication challenges, create a webview, and then manage the interaction with the IdP culminating in the redirect to the original service provider, where the SessionID token is obtained. For additional info on integrating a corporate SAML2 IdP, see here. The configurations required on-device to make this work are set to the HttpConversationManager by registering and implementing a SAML2 Configuration Provider. See in the following example how a SAML2ConfigProvider is added to the CommonAuthenticationConfigurator, which then sets the configurations to the HttpConversationManager. We’ll go into detail on the CommonAuthenticationConfigurator in the next section, but in this case, just think of it as a sort of NSURLSessionConfiguration for the HttpConversationManager. A filter on the response (ResponseFilter) looks for the presence of the responseHeader (e.g. com.sap.cloud.security.login, then the HTML content with “SAMLRequest” string. This indicates that SAML2 authentication sequence is required. The ResponseFilter presents a UIWebView, and attempts to load the URI of the finishEndPoint (e.g. /SAMLAuthLauncher). This is GET, and should not be a modifying request. The Service Provider responds again with the HTML content, with the responseHeader, and SAMLRequest body. This time, the HTML is not intercepted, but is loaded normally in the UIWebView. This allows the onLoad() function in the page to execute, which POSTs the SAMLRequest blob to the SAML IdP. The SAML IdP responds with an authentication form, and/or mutual auth challenge. In the simple authentication form case, the end user enters credentials, and submits the form to the IdP. In the mutual auth case, the challenge is handled by a NSURLProtocol which is registered by the HttpConversationManager, specifically for the lifetime of the UIWebView. The NSURLProtocol invokes a Provider to obtain the SecIdentityRef, which will be described shortly. Once the UIWebView has authenticated against the SAML IdP, the IdP responds with a ‘SAMLResponse’ HTML page, which contains a similar onLoad() function to POST the SAMLResponse body to the original Service Provider. The Service Provider accepts the SAMLResponse assertion, and allows the request to the finishEndPoint, which attempts to redirect the UIWebView to a URL with the finishParameters query parameter(/s) (e.g. : finishEndpointParam). The ResponseFilter tests the current URL of the UIWebView, and on detecting the finishParameters, determines that the authentication was successful. It dismisses the UIWebView. The SessionID token from the Service Provider is now in the Cookie Jar, so the original request is completed (retried) by the HttpConversationManager, and the callback returns to the original request completionHandler:. So, after the HttpConversationManager is configured, you may see something resembling the following properties set on the object. (This is the default set which is provided by the logonConfigurator factory method on the <MAFLogonNGDelegate> protocol). Note the logic of the implementation: OAuth2 authentication requires checks at the start of a request (does bearer token exist? ), and in the absence of the token, management of a multi-step procedure with checks on the response from the auth token provider. 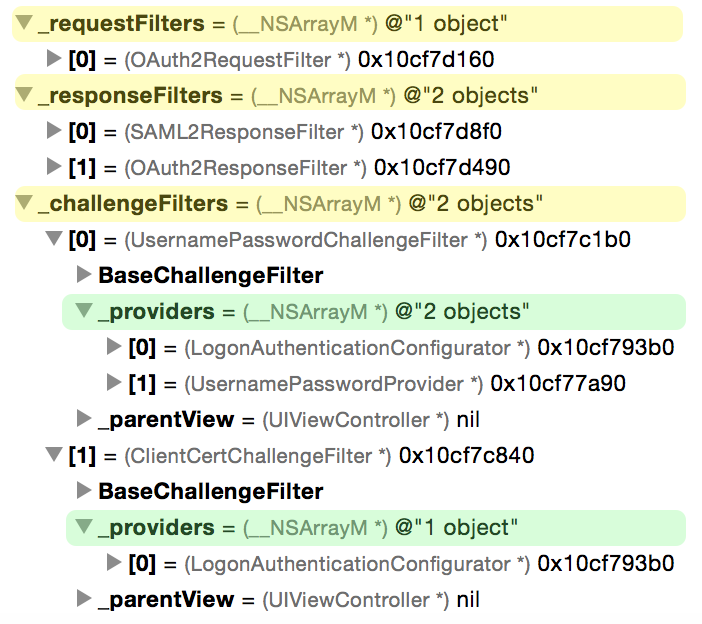 So, OAuth2 support is implemented with both a RequestFilter and a ResponseFilter. SAML2 authentication (as described above) requires checks on 200-type HTTP responses, to detect payloads related to redirects to the SAML2 IdP. That logic is encapsulated in a ResponseFilter. The configuration for the SAML2 interaction is supplied by a ConfigurationProvider. Basic and Client Certificate authentication can both be handled within the regular HTTP authentication challenge framework. The NSURLSessionDelegate invokes -didReceiveChallenge:, passing the NSURLAuthenticationChallenge. The UsernamePasswordChallengeFilter and ClientCertChallengeFilter execute on the challenge, and supply the correct credential provider: If the challenge is for basic auth, the UsernamePasswordProviders will be tried; if for client certificate, then the ClientCertificateProviders will be tried. Providers are tried sequentially in their containing NSArray. In short, you have a very flexible framework around the NSURLSession for managing the authentication, and any custom behavior you need to attach to your networking.